9h may refuse the conclusion of the contract in any of the following cases. When 9h is fully booked and no sleeping pods are available. malfunction of the facilities or other unavoidable causes. Services beyond those provided are requested. or conduct their selves in a disorderly manner. When it is obviously acknowledged that the Guest is an infectious case. When the Guest is heavily-intoxicated. This applies even after Check-in. When the Guest speaks or acts in a manner that is deemed an annoyance to other guests. crime syndicates or any antisocial groups. 9h will not charge the Guest for any of the services in future during the contractual period which he/she has not received. Hilarious.... and somewhat disturbing at the same time. The website says explicitly that the floors and elevators are separated by gender as well. This makes me wonder what type of person uses these sorts of hotels - not simply business people on the go? Does the architecture encourage the kinds of behavior of the guests, or the other way around? Does morality fit into the picture? 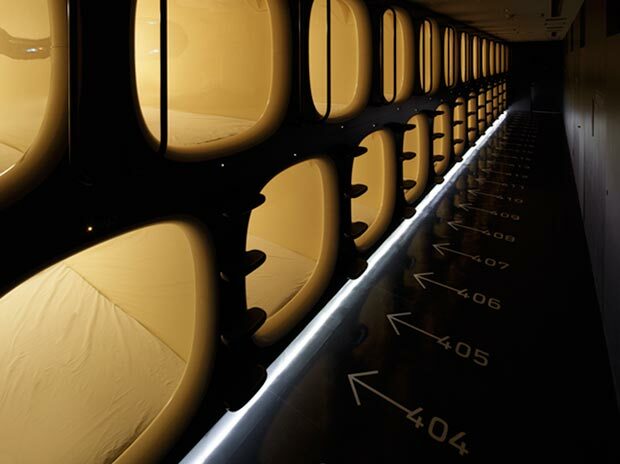 In any rate, I don't think this is exactly what Kisho Kurokawa, architect of the Nakagin Capsule Tower, had intended when he built the first of capsule hotels in the 1970s, more under the premise of accommodating change and recyclability within architecture as part of the Metabolist movement. In browsing their pictures, I was at first inspired by their toothbrushes, which boast a "firm, easy-to-grip handle that helps you brush your teeth thoroughly." However, what really sold me was their bottled water: "Taken from springs at the foot of Mount Fuji, this natural mineral water contains a lot of Vanadium. Nishikatsura, the bottling site is an area surrounded by springs, mountains and lush green nature." Mmmm, drinking "lush green nature." 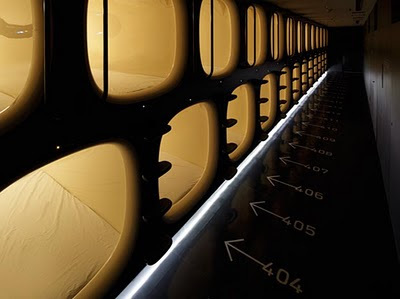 Only the Japanese would think of bottling that and providing it complimentarily to their capsule guests.